An imposing tree with reddish bark finds itself cornered in the Peruvian Amazon. Exploitation and destruction of its habitat continues as the state's attempts to protect the species from the pressure of the timber trade fail. Scientists estimate that if no measures are taken to protect it, the species could become extinct in 10 years. Approximately 4,000 m3 has been illegally extracted in 2018. Madre de Dios, Amazon region in the south east of Peru. A group of loggers has just unloaded their plunder onto the banks of the Las Piedras River at the small port of Sabaluyoc. The sky becoming hidden by black clouds. A storm is brewing and they will have to wait for the rain to pass before they can leave via muddy track that leads to the Interoceanic Highway which connects this part of the country with Brazil. The illegal logging of trees more than 500 years old is one of the greatest threats facing the Amazon. 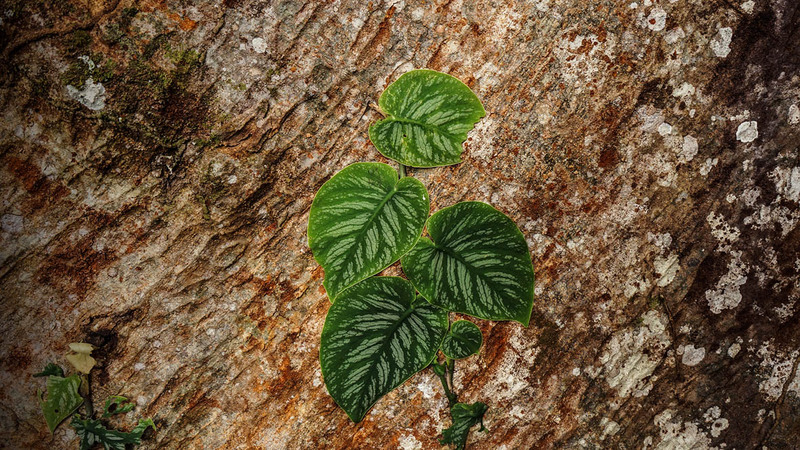 The shihuahuaco, an imposing slow growth tree with a girth of one meter, a height of 50 meters, and a lifespan of up to 700 years, is currently one of the species most under threat. Some researchers claim that if the pressure on this tree persists, it may be entering its final days. The shihuahuaco is by no means the first tree to fall victim to the interference of man and his demand for timber. Commercial pressures have already brought species such as mahogany and cedar close to extinction. TERRITORY. So far in 2018, Osinfor has identified almost 4 thousand cubic meters of shihuahuaco of illegal origin from the Amazon. Cedar and mahogany, whose high quality and durable wood had been extracted in large quantities by both legal and illegal loggers, were included in a 2001 list of protected species by the Convention on International Trade in Endangered Species of Wild Fauna and Flora (CITES). The agreement, signed on to by Peru in 1975, remains in force today. Although the international trade of cedar and mahogany was controlled between 1990 and 2000 preventing their extinction, the number of trees has nonetheless fallen dramatically. In the absence of laws and regulations that protect them, other species, such as the shihuahuaco, have become the loggers preferred choices. Article 138 of the Forest Management Regulation requires the risk classification of wild flora to be updated at the latest every four years. But no amendments have been made since 2006. According to Daniel Valle, a Peruvian expert in biological conservation, “today mahogany is scarce and now the shihuahuaco is being threatened in the same way.” This species is found in the departments of Loreto, Ucayali, and Madre de Dios. And CITEmadera, the most recent report prepared by the United Nations Food and Agriculture Organization (FAO) and the Technological Institute of Production (ITP), indicates that more than 60% of the companies operate in these three departments, with 79% of the turnover in forestry and timber extraction also generated here. The National Forestry and Wildlife Service (SERFOR)—an authority attached to Peru’s Ministry of Agriculture—organized a working group in 2015 comprising 99 specialists from across the country to determine protective measures for the shihuahuaco and other species. The group was supervised by the Ministry of Environment (MINAM) and aimed at reviewing and updating the list of endangered wild flora. The final proposal—published in September 2016—included the shifhuahuaco on its list of 705 species, 87 of which were classified as endangered and 61 as critically endangered. The risk classification of wild flora should be updated at the latest every four years. But no amendments have been made since 2006. Despite the requests and recommendations by scientists, they never made the classification official. What happened? At the end of 2016, the Hildebrandt en sus trece weekly newspaper published a report detailing criticisms made of the working group’s document by Elialdo Motta, a monitoring officer for Bozovich Timber Products. This company is a subsidiary of the Bozovich Group, one of the country’s most important timber consortiums. Motta claimed there were no quantitative studies that would justify including the shihuahuaco on the list of threatened species. Scientist Wilfredo Mendoza was coordinator of the study. He told Ojo-Publico.com that whilst the shihuahuaco’s new classification would have ensured that the “trade be more controlled”, it was always controversial during the working group´s discussions due to its high commercial value. SERFOR responded with a letter of its own in January 2017. It noted that during the process information gaps had been detected for certain species and precluded their classification. Signed by Walter Nalvarte, of the Directorate of Sustainable Forestry Management and Wildlife Development, the response claimed that the group had not conducted a population analysis of the species. Yet this assessment is the responsibility of SERFOR itself. 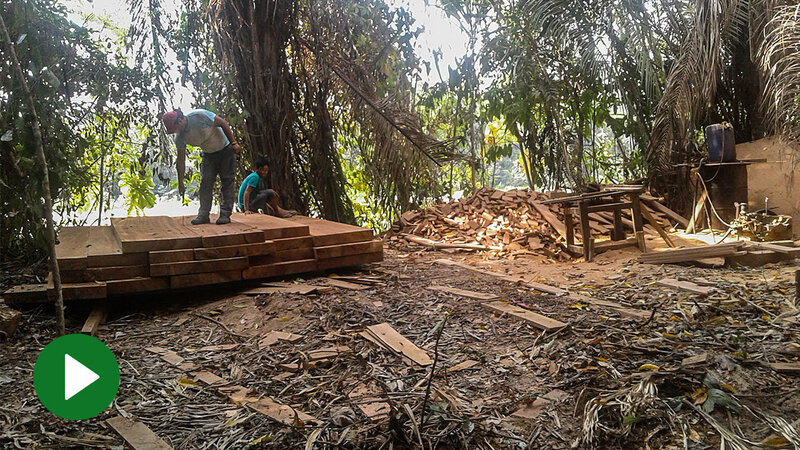 “The opinion of the logging companies carried more weight than that of the scientists", said Rodolfo Vásquez, a researcher and scientific forestry coordinator for the study. Members of the group then pointed out that the study both systematized and analyzed 30-years’ worth of information and then contrasted this with data from the Ministry of Agriculture’s official forestry yearbooks. SERFOR provided no further response and the scientists’ study recommending the inclusion of the shihuahuaco in the list of threatened species has been shelved. SERFOR argues that the re-categorization of endangered species is still under development. The organization’s press office informed Ojo-Publico.com that its staff are “processing the scientific community’s contributions and additional information, for example, the first results of national inventories.” However, the inventory for the regions where the shihuahuaco species is found (Loreto, Ucayali and Madre de Dios) is barely 9% of the total. In this context, a complete update of new species that are in high demand in the international market seems a long way off. According to the audits carried out by the Forest Resources Oversight Agency (OSINFOR), between 2009 and 2017 more than 2 million cubic meters of illegally sourced timber were traded. This is equivalent to 75 thousand loaded trucks. The most logged species are tornillo (9%), lupuna (8.8%), cumala (8.6%) and hihuahuaco (5.5%). Audits undertaken in licensed areas during 2017, showed more than 23 thousand m3 of logged shihuahuaco. As part of this investigation, Ojo-Publico.com learned that the principal destination for the most traded species is the United States, followed by China, Mexico and the Dominican Republic. The uses include furniture, parquet, and door frames. Illegal logging of these trees threatens not just the species themselves, but also the animals that use them for nesting. For example, the splendorous harpy eagle, one of the world’s largest birds of prey, which makes its nests in the tallest trees and is one of the world’s largest birds of prey, is hardly seen in Las Piedras and visitors are lucky to see it in flight near the forest. The trail of soil and mud that must be crossed to reach the Las Piedras basin is one of the two routes that allow contact with the indigenous communities of this part of the Amazon. The isolation in which this and other Amazonian communities have chosen to live has led to the violent and unpunished logging. 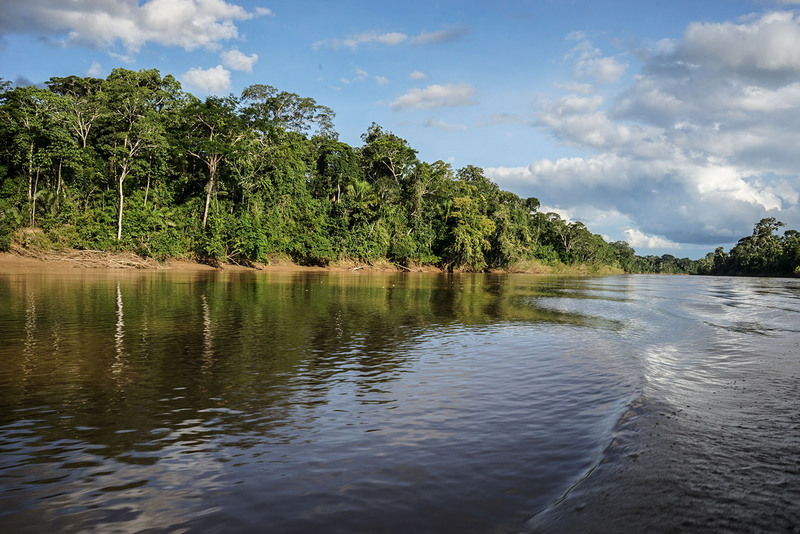 In 2014, the indigenous leader Edwin Chota was shot here for reporting the trafficking of timber. The prosecutor’s office responded to his complaints only after his murder. On the other side of the riverbank the sound of saws in operation can be heard. They tell us that that quinilla is being felled. There are no logging permits for this area. As is the case with other species, the planks will be sold using falsified documents that will “launder” their illegal origin. 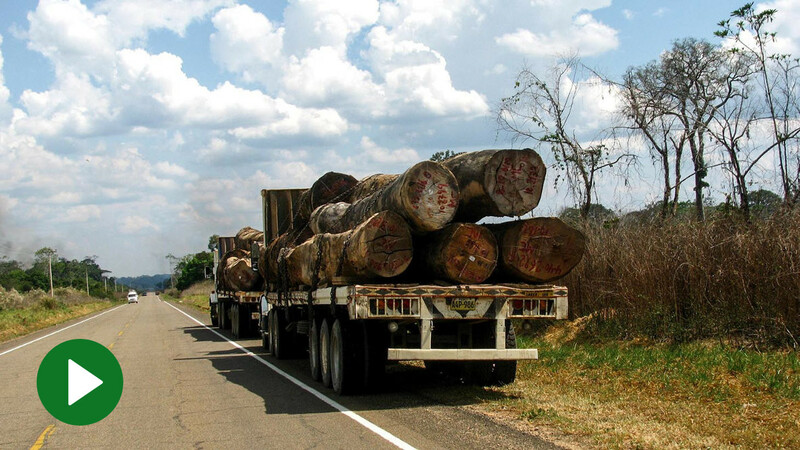 Recently, the Madre de Dios Environmental Prosecutor's Office learned of a complaint about illegal logging of shihuahuaco, cedar and lupuna in the basin. The loggers were using electric saws made of a special material to cut the trees down. They took advantage of the weak monitoring in the area. Neither the Prosecutor’s Office nor OSINFOR could take action. The people responsible have not been identified. YINE. 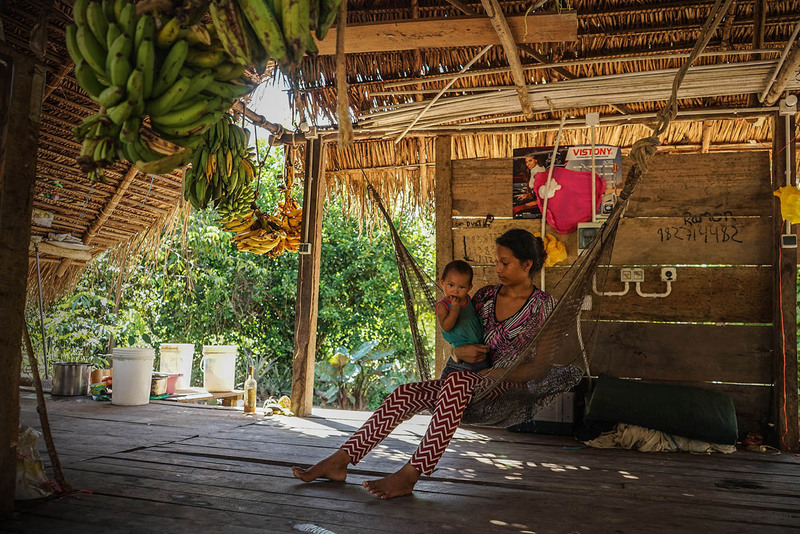 Indigenous communities of this part of the Amazon are threatened by the timber traffickers. According to OSINFOR, Madre de Dios has the largest number of inspectors (2,026) in charge of supervising forestry concessions. It is followed by the regions of Loreto (970) and Ucayali (595). Staff say that this number is insufficient to check that the administration and the exploitation of the licensed resources are consistent with the companies’ forest management plans. The supervision work involves trips to the forest where access is often only possible on foot or by boat. In the Las Piedras basin there is no cell phone signal or internet. The only state service that the Yine Indians receive is a solar energy system for which they have to pay. 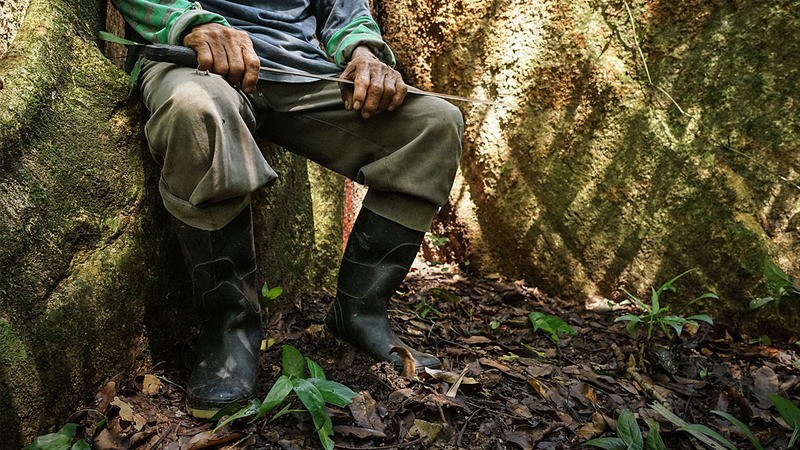 Between 2009 and 2017, the environmental prosecutor’s offices and courts throughout the country investigated almost 8000 people in cases related to illegal logging and trafficking. Madre de Dios, Lambayeque, San Martin and Ucayali departments registered the highest numbers, according to the information obtained and analyzed by Ojo-Publico.com. The principal offense is crime against forests or forest formations, followed by illegal trafficking of forest timber products. Back on the banks of the Las Piedras River, the engine of an approaching boat can be heard. Like many others that we saw during the trip, it is transporting timber. They will not unload it in the small port, but instead a few meters further on, where nobody can see them.